** Saturday, July 16: Updated with much better images, as well as swatches of Outremer. 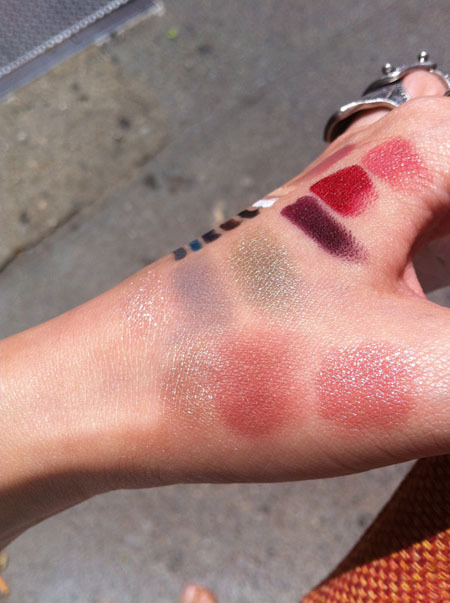 In case it's not obvious by now, I'm the type of girl who goes to counters on the first day a new collection arrives. In fact, I get a nervous buzz and become hyperactive when I don't know the exact dates coveted collections get put on display. You would think I'm hyperbolizing all this, but I really am not. 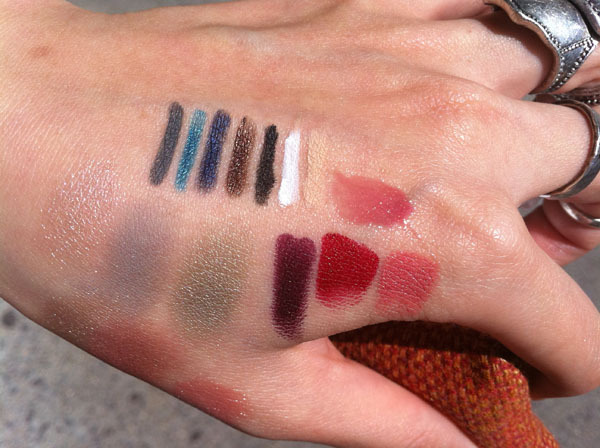 Anyway, here are some quick swatches I took of the NARS Fall 2011 collection. 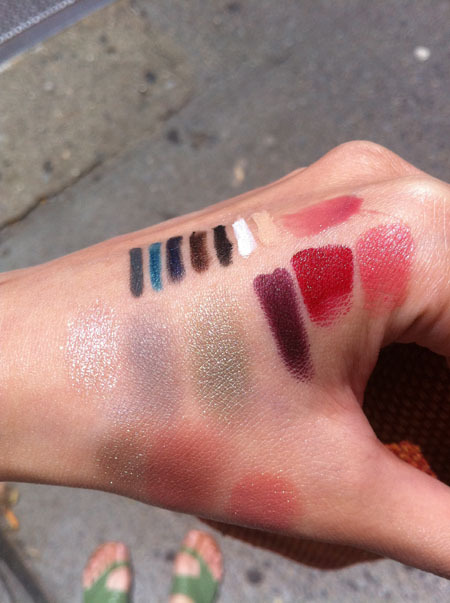 Whack me on the head because I just realized I forgot to swatch Outremer. Outremer could, would, and should have been The Blue That Ended All Blues, but it turned out to be such a heartbreaking disappointment. It applies patchy, dismally sheer, and when used wet it does not reflect the vibrant International Klein Blue-ness that sits in the pan. I was appalled! Out of desperation I tried using it over a primer potion. 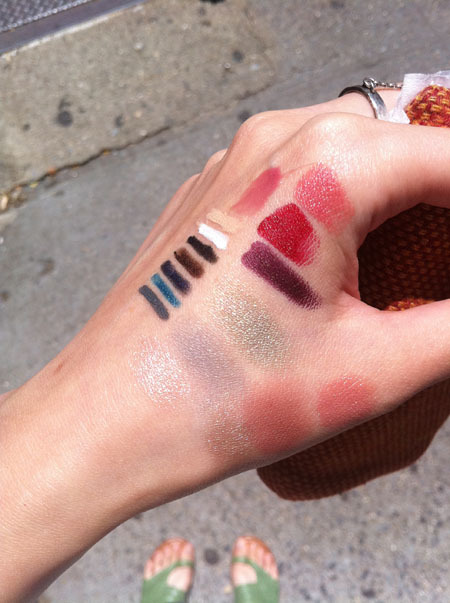 The swatch on the most right was made over UDPP using the NARS smudge brush when a regular eyeshadow brush failed. I had to "push" the color into the skin, and only after a few layers did I manage to get that swatch. Even then, it wasn't as vibrant as the color you see in the pan. I firmly believe that one shouldn't have to make a product work for you, especially not at $23 a pop. I had a full makeover done with one of their international makeup artists, Julio Sandino. The man is a wiz with skin! I'm now tempted to get the Sheer Glow Foundation even though I need it like I need another My Lips But Better lipstick (not at all). As mentioned, Julio applied the Sheer Glow Foundation on me. He then contoured/highlighted/produced natural flushes with my new loves, the Multiples in St Barts, Luxor, and Maui. I asked Julio to do a look with the Delphes Trio, and he decided that a light wash would be more appropriate for daytime. He used the light green as an all-over wash on my lids, blended the gray along my crease, then used the peach as a highlight under the brows. He lined my eyes with the charcoal gray Larger Than Life Longwear Eyeliner and applied a thin coat of mascara on my lashes. I'm wearing the new Pago Pago lipstick layered with Oasis lipgloss on my lips. The perils of swatching. You forget you have color all over your hands. I picked up the Multiples, the Grand Palais Duo, the charcoal gray liner, and Train Bleu Velvet Matte Lip Pencil for today. Looking at the pictures now, I'm not sure why I decided to forgo the trio. At the time I thought the colors were too sheer for my liking, but in retrospect, the light wash is kind of amazing. One of the best things about NARS is they don't play the scramble for the limited edition game. I know if I change my mind in the next couple of months, the trio will still be there. You're RIDICULOUSLY gorgeous, and that look is amazing on you! oh wow do i love you. i am COMPLETELY insane as well when it comes to new collections. and asian eyes! yay! where did you get that gorgeous ring? 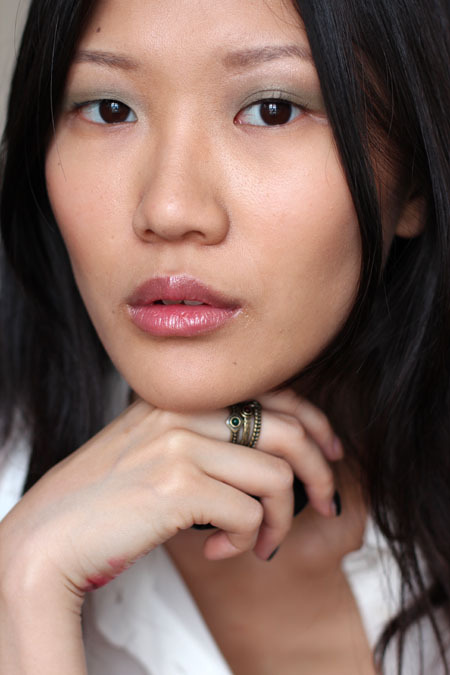 Xiao, I spoke with the gorgeous wonderful NARS manager, Sasha at Barney's about the problems you had with Outremer. Now even she knows some NARS just don't make the cut. She did say that with this one you need to apply something shimmery underneath so it works. You should stop by and meet her. She walks on water as far as I'm concerned. I live in Delaware and will take the train to NY just to see her. @MickiD That's great. I would love to meet wonderful NARS people! Did you just come down to NY? I too don't feel like I should have to "Make" something work. But if I buy something and regret it, I have to make it work. I can't just let it sit there. When I buy from Sasha though, I never regret as she won't sell me something that isn't for me, or isn't a good product. You should stop by and meet her. I have a feeling you 2 would have a blast. You have such a great sense of humor, as does she. I actually love Outremer. It's the sister color to Daphne, which I know was universally hated, and which I also love. 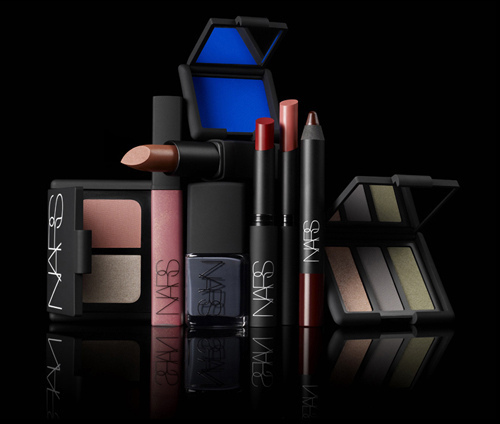 Francois Nars puts so much thought into his collections, so whenever I see a color combo or texture that doesn't seem to make sense, I view it as an invitation to think about the product in a different way. It would've been easy for him to make Daphne and Outremer into big, bold, pigmented mattes a la MUFE, but he chose to go a different route. As a result, I've been discovering the beauty of these eyeshadows in layered, textured combinations...the result is a very modern interpretation of bold '80s color. 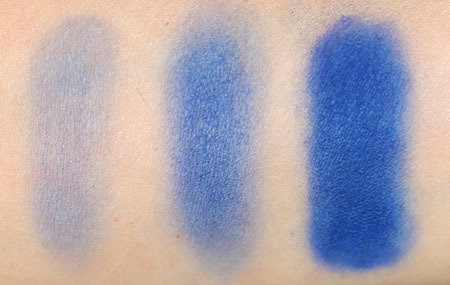 Part of my disappointment is because I feel like a good International Klein Blue eyeshadow hasn't been made (or I don't know of its existence yet) and I'd be more interested in that than the sheered out version that Outremer is. Regardless, I'll play around with Outremer and see if I change my mind about it! Thanks for your thoughts! Outremer would have been the perfect blue had it been velvety in texture and not chalky like Daphne. Takes too much work to make it work, if you want the intense color. For a beautiful true blue, go with Make Up For Ever #167, iridescent true blue. I'm interested to know what colour sheer glow he used on you and any thoughts on it?